How to Avoid The Easter Binge!! 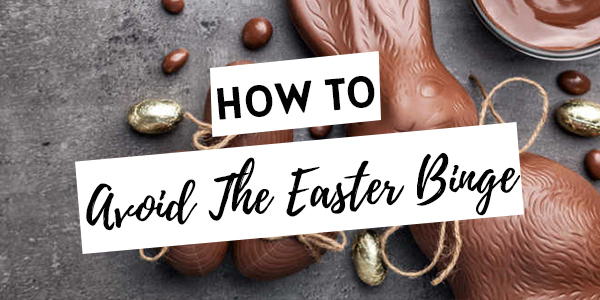 With easter just around the corner it’s difficult to avoid the “holiday” binge: chocolate, hot cross buns….You eat until you feel sick, indulge in the sugar high until the guilt kicks in and you hate yourself for it days later? Does this sound familiar! Well this year is going to be different! Here are a few quick tips to help you avoid the guilt! Prepare a healthy version of your favourite food – If you cannot resist enjoying a hot cross bun or two lathered in melted butter then why not opt for a “healthified” version without all the sugar! See recipe below! Make a Plan of Attack – on the day before you get to an event or party, create a plan of attack! Decide how much of what you are going to have and make sure you stick to it!! Also by making the promise with yourself to not feel guilty as you will be get back to eating like normal the next day! Hydrate!! – Water can help you curb cravings for bad foods. Often, when you feel like your body is longing for foods, all it really needs it water. Your hunger signals can easily get mixed up. Limit the booze - we all know that feeling when we’ve had a few champagnes, our judgement becomes clouded and we find ourselves reaching for the second or third piece of cake! Pace yourself this Easter, and hydrate yourself with a fresh coconut water or sparkling water with lime! Get Moving - Exercise is not about punishment or “making up for” what you’ve eaten. Do it because it feels good and keeps you in a happy, healthy routine. 1. Preheat the oven to 180C and line a baking tray with baking paper. 2. Place the flour, cinnamon, ground ginger, baking powder, baking soda, currants (or sultanas) and apricots in a large bowl and combine. 3. Place the milk, maple syrup or honey, coconut oil, lemon juice, vanilla extract, orange zest and one egg in another large bowl and whisk until well combined and a little ‘fluffy’. 4. Add the wet mix to the dry ingredients and fold through gently until just combined and a sticky dough forms. 5. Lightly dust a clean bench with flour, place dough on bench and using floured hands form the dough into round buns. Then place the buns on the prepared baking tray. 6. Whisk the second egg, and using a pastry brush, lightly brush the top of the buns. 7. For the cross: whisk egg whites and desiccated coconut. Drizzle over unbaked buns in a cross shape with two spoons or using a piping bag. 8. Bake in the oven for 15-20 minutes or until golden brown and cooked through. ENJOY!